Florence Barton descibes her work as a projectionist. Joan Pearson descibes the process of maintaining the boiler. The work of a projectionist was physically strenuous and technical. As Flroence Barton and Joan Pearson ascknowledge in these audio extracts, they were not exempt from the heavy labour and had to carry out all ofthe duties expected of the projectionist. In the first extract, Barton gives an overview of what was expected of a projectionist. In the second, Pearson tells a story of a particualrly messy aspect of the job - cleaning the boiler. Letter regarding Joan Pearson's redeployment. Although the day-to-day duties of the projectionist were the same whether male or female, it was felt by some managers that particualrly extreme types of projection were too physically demanding to be undertaken by women. Cinerama, for example, was a widescreen format with each image being composed of three overlapping pictures projected by three projectors running in synchronisation. 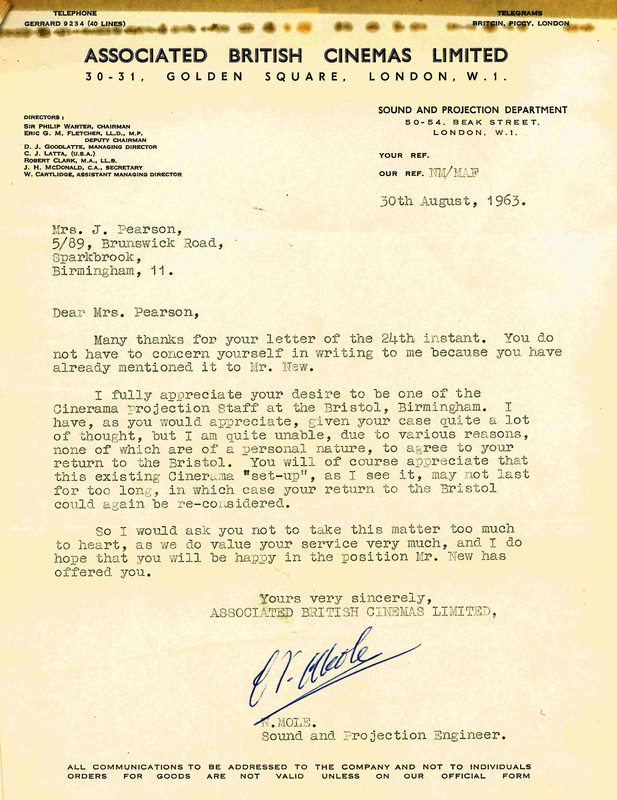 This system trebbled the weight of the film prints, and as the letter below shows, in the case of Joan Pearson it was felt that this was too demanding for a woman. As a result she was redeployed to the A.B.C. Sparkbrook cinema when her former cinema was converted to Cinerama.